Can You See Me Now?? 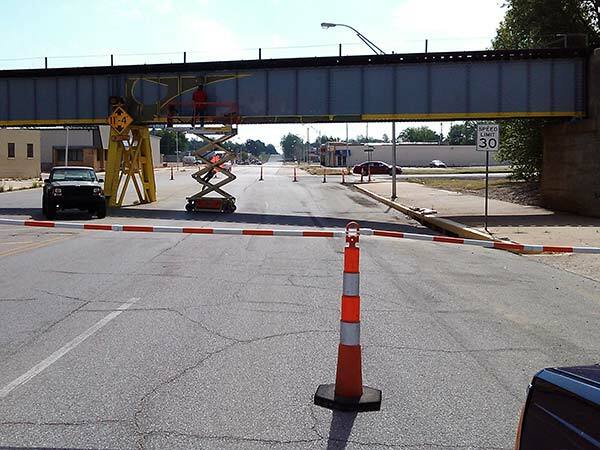 Trucks continued to smash into this bridge despite flashing lights and warning signs, so the City of Enid decided to add another attention grabber: teeth! Five minutes outside of town there are views so far into the distance that one can almost see the curve of the earth over the wheat fields. Meanwhile about fifty thousand of us call Enid home, sixty thousand for Garfield County. 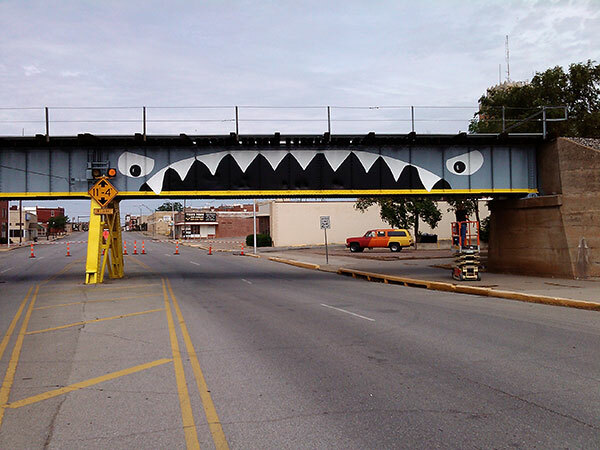 This railroad bridge downtown was built in 1908. About four times a year a truck would smash into the bridge, closing the road and costing tax payers quite a bit for clean up. Recently the hit numbers went into the double digits and something needed to be done. Here is a photo of the original artwork proposal by artist Wayne Shearon, which he had airbrushed on a transparent overlay. This shark is approximately one inch high by six inches wide. Many incarnations and digital renderings later, the City decided on the version at the top of the page. 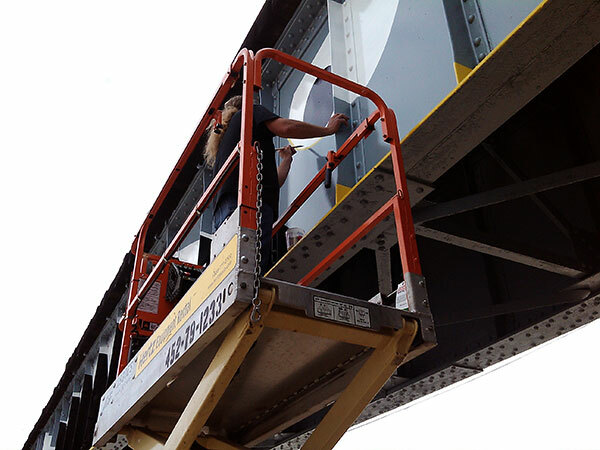 The finished paintings on the bridge are six feet tall by seventy-two feet wide. 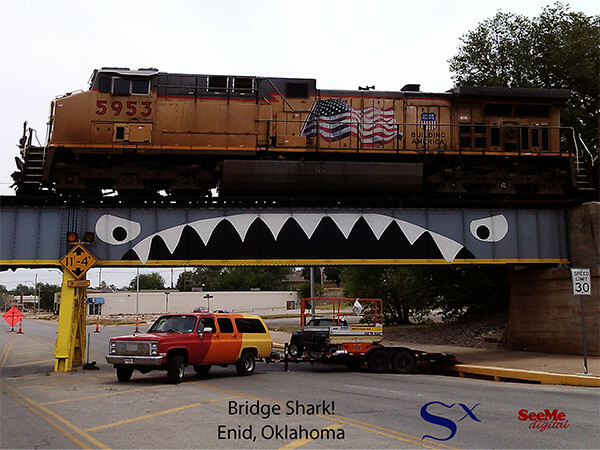 Some Bridge Shark merchandise is now available through RedBubble. You can tap or click the images below to see the item selection so far. The Bridge Shark made an appearance on the Chive September 14, 2014 in a list entitled "Every street should have some art", number 13 of 30. 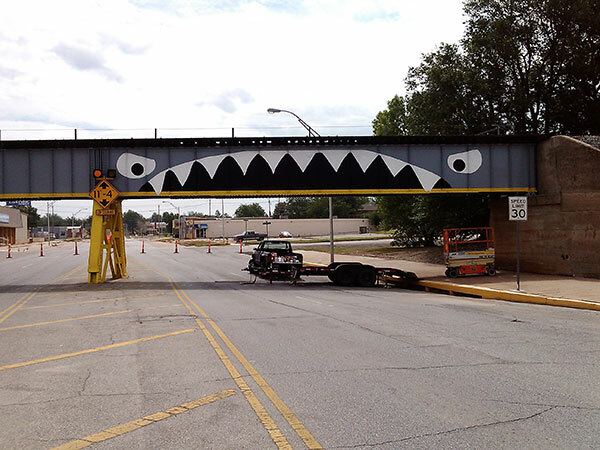 Also the front page of Reddit Funny, "My hometown bridge claimed another one" April 27, 2015 had 6,540 points with a 97% upvote, referencing the truck-eating Bridge Shark IMGUR photo with 9,591 points and over three million views. You can see some of the artist's other work at the Sx Custom Fabrication website.